Makes caller number visible in CallLog and exact call date/time visible in context menu. Homescreen must be restarted after applying/removing patch. Please update it to work with SFOS 2.2, also thank You for Your hard work ! Sorry, but this patch is no longer supported. Voice call combined patch has got allthe features from my patch, and i don't see any reason to maintain it. hmm, it works perfectrly fine for me. Did you forget to unapply the patch before upgrade? It can break the apps and then you won't be able to apply any patches. Hi, thanks for reply. I use patchmamager 2 and I cant install combined patch coz "nothing provides voicecall-ui-jolla " I can install this by pkcon but Im curious if this will not affect my future SFOS updates. 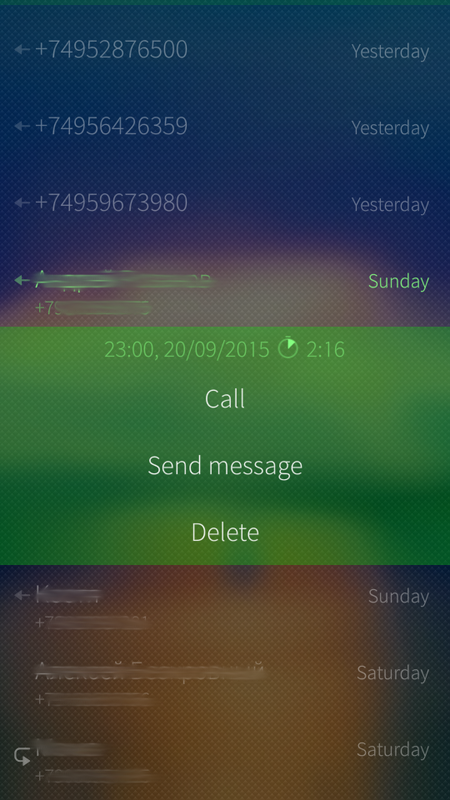 It seems that every sfos should have voicecall-ui-jolla installed, I mean isnt it a phone app ? So please if You can give me some hint about it, why isnt voicecall-ui-jolla installed and should I/Can I carelessly use pkcon to install it and forget about it ? Thank You for Your help ! I decited to let it try anyway, but after executing devel-su pkcon install voicecall-ui-jolla (after pkcon refresh ) it looks like its getting installed but after it shows its done I have the same error msg trying to install combined patch. So I once again try pkcon install voicecall-ui-jolla and It shows that I can install voicecall-ui-jolla therefore its not installed and I can do it over and over again without any success :x Please instruct me what Im doing wrong, Thanks in advance! oh, that's weird. I think you better ask on TJC.